Mine plastic surgery is selected as the Top 10 Health, Beauty & Fashion brand category & has been awarded at the 10th Seoul International Convention Center, Seoul, K-brand Top 10 awards ceremony. This K-brand TOP10 awards ceremony is hosted by the Overseas Chinese Media Cooperation Organization & the alliance of Overseas Chinese Media Cooperation Organization is a joint venture between the Chinese mainland and overseas Chinese territory, which has a great influence on China's economic development and global economy & it is hugely influential in China and overseas country in case of distribution. Moreover, it is launched in 24th media outlets as in TV, newspaper & etc. & produces Chinese contents for about 1.7 billion Chinese market. This time people joined this ceremony from 5 continents & 20 countries. Delegates attended the ceremony, including the President Park Geun-hye & chairman of the National Assembly's Foreign Affairs & Unification Committee, Na Gyeong-won,. This event is held through economic cooperation, culture, tourism & sports exchanges. It is regarded as one of the most significant events for the prosperity of East Asia & acknowledging recognition & honor in beauty and health & fashion categories. Mine Plastic Surgery is a complete beauty medical center, which consists of plastic surgery, dermatology, stem cell lab, & cosmetic beautification with top notch advancements. They are credited for a high quality of medical service, equipment, effectively customized treatments & special medical facilities. 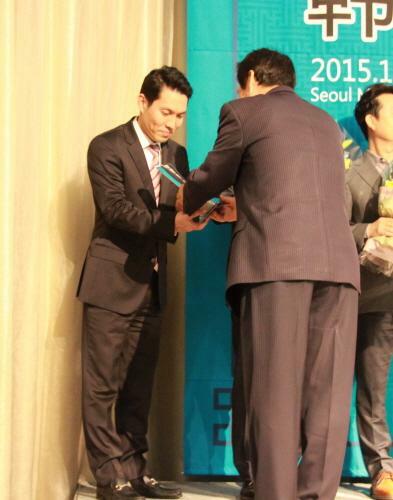 The representative & CEO of MINE Plastic Surgery Clinic Dr. Sung-Wook Lee said, “It is really an honor to have received such a glorious award. We will try our best to assure patient’ safety & I will continue to make efforts to achieve high-quality surgical results.” & then he revealed his strong ambitions about showing developed group of medical area & taking it further in the future.